Driving Norway's E39 coastal highway from Bergen to Stavanger means encountering some of Norway's car ferries. 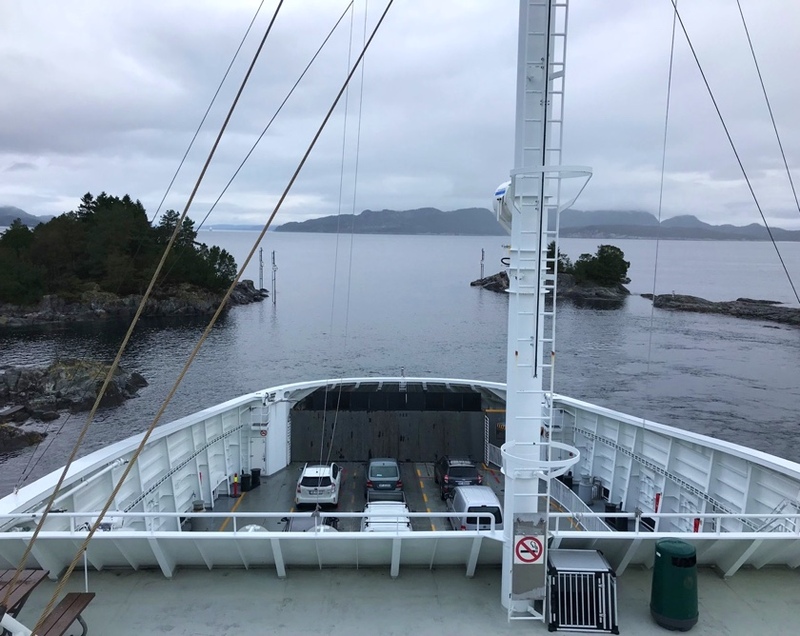 One of the joys of driving long distances through western Norway is the many ferries that provide a natural break in the journey – as long as you're not in a rush, of course! Many of the journeys are just 15 minutes or so and barely worth getting out of the car for. Not so the Sandvikvåg to Halhjem ferry, which gives drivers a 40-minute break from behind the wheel. On a recent trip to Stord, I needed to take this ferry twice in three days, so decided to whip out my camera and tell you all about it! This ferry forms part of the E39 highway between Bergen and Stavanger. 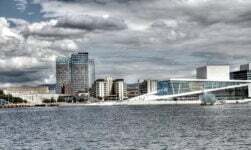 It joins the mainland with the northern part of Stord, a large island around half-way between the two cities near the mouth of the Hardangerfjord. As the ferry is considered part of the road rather than separate transport, the road abruptly ends at the ferry terminal. 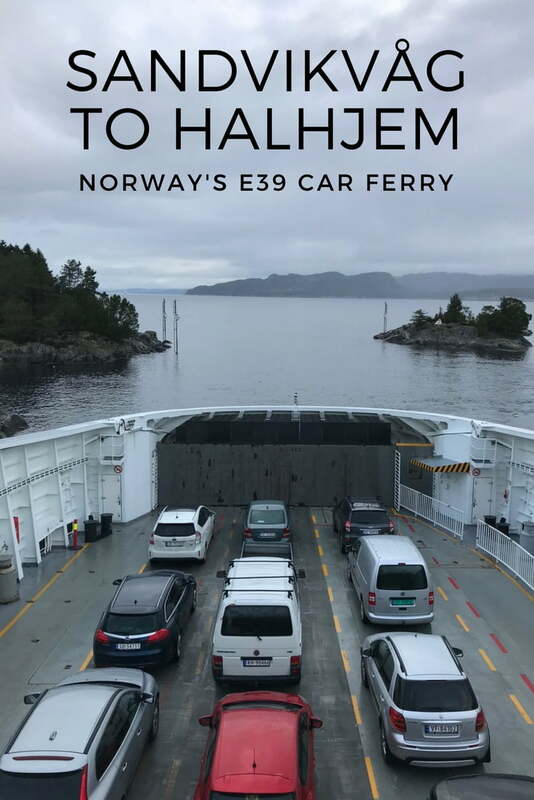 With most of Norway's car ferries, you pay on board or as you are driving on. But as this one is much more heavily trafficked, there is a set of booths at which you pay before driving into the waiting lanes, as the above picture shows. 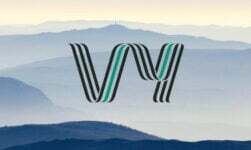 Departures are every 30 minutes throughout the day with differing schedules in the evenings, overnight and at weekends. Most locals know the schedules well, so even when the lanes are near-empty at five minutes before departure, there'll usually be a sudden influx of last-minute arrivals. The ferry takes all wheeled transport including lorries, public buses and private coaches. 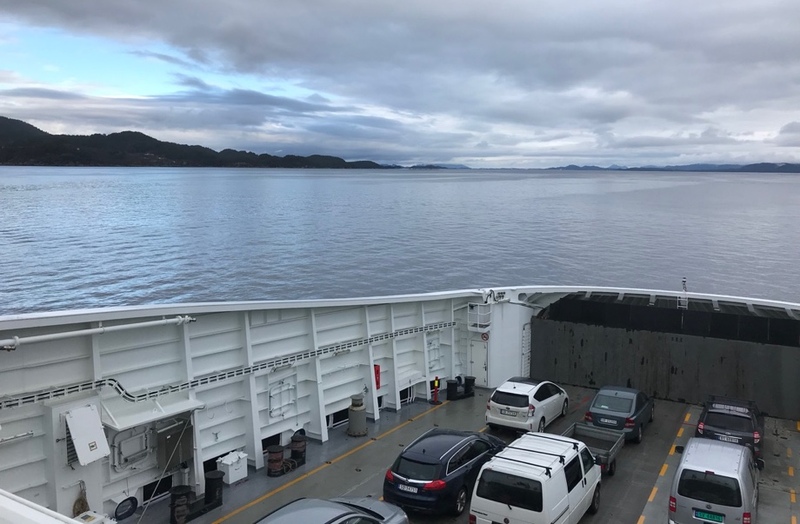 Although there is limited space on board, I haven't yet experienced a car ferry where I've been unable to board and had to wait for the next departure. 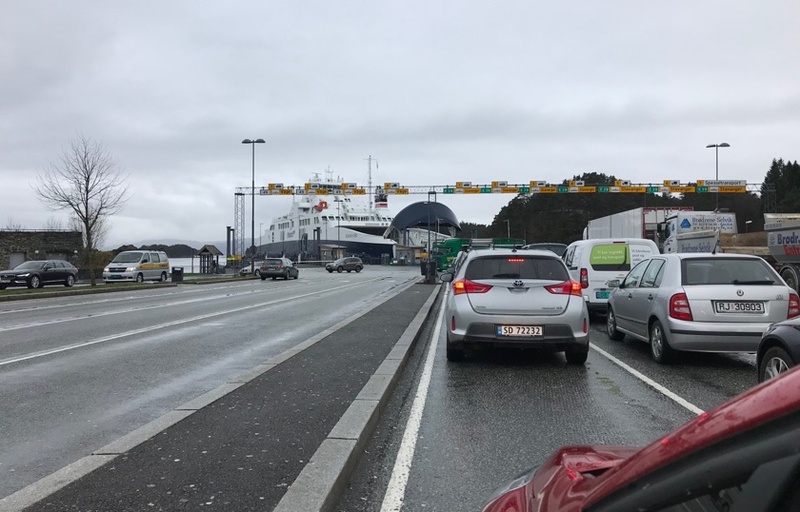 There is room for several hundred vehicles on this one, which to be fair is one of (if not the) biggest car ferry in operation in Norway. 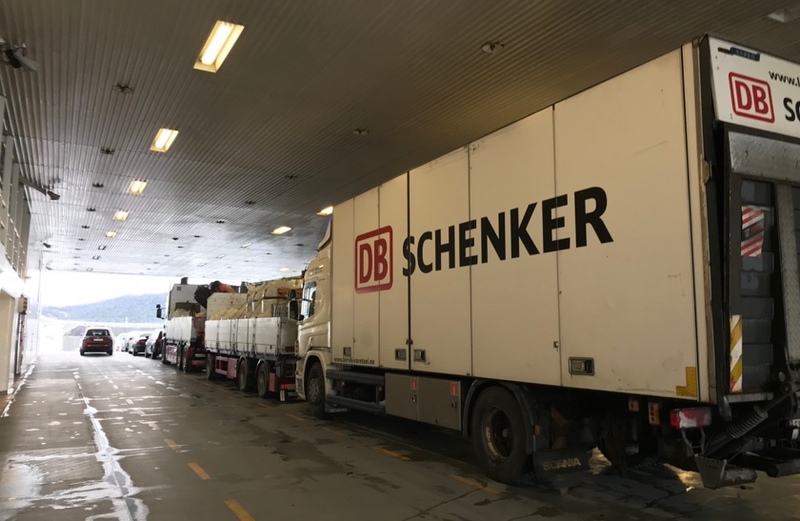 Driving on the vessel, staff direct you to a suitable parking spot, which could be on the main vessel deck (above) or in a basement level accessible via a ramp. You can stay in the vehicle, but most people head on up to the passenger area as the duration of this journey is around 40 minutes. On a sunny day, the views from the decks are beautiful but it can be pretty windy. Sadly for me the weather was far from good on both my journeys and so after taking a couple of pictures, I headed into the main passenger lounge. 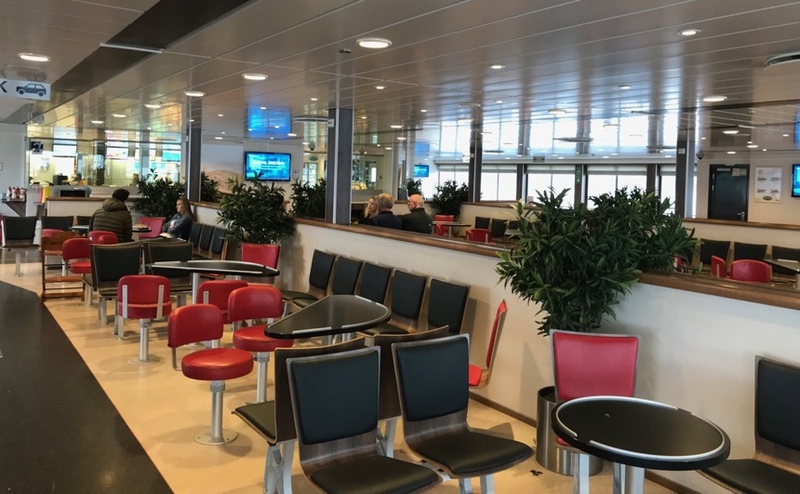 Even quite small car ferries in Norway tend to have a lounge and kiosk for passengers to take a break from driving. 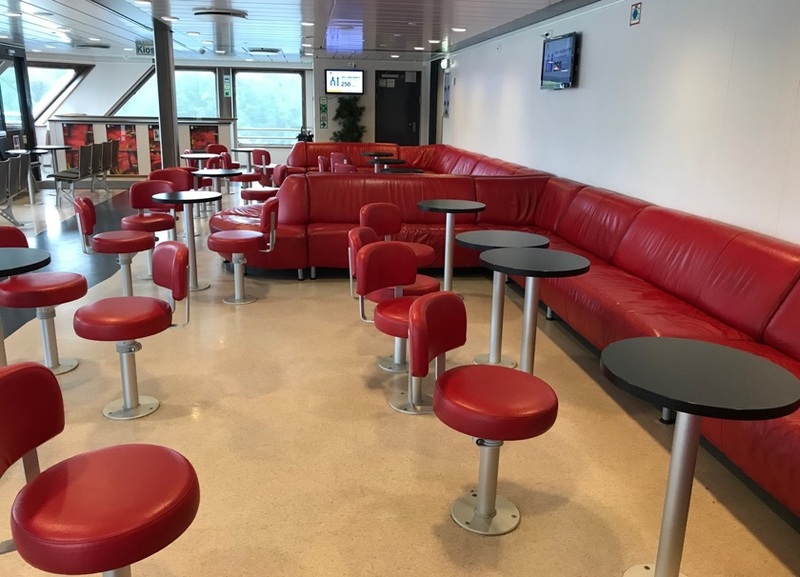 The lounge on the Sandvikvåg to Halhjem service was much bigger than I've seen on other vessels, with plenty of room to relax. There were also several bathrooms, a more comfortable sofa area, and even a (tiny) playroom for kids with a small TV showing cartoons. The kiosk was more substantial than many of Norway's car ferries, which usually sell coffee and a couple snacks. 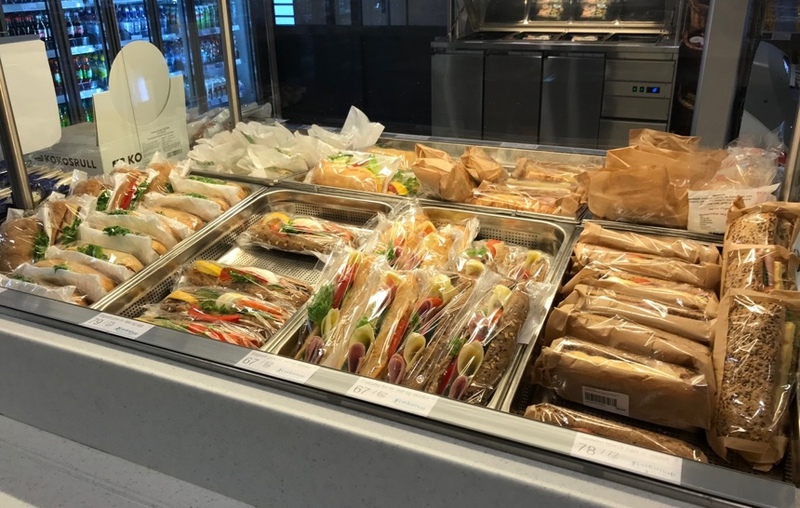 This one served hot food and a pretty wide selection of pre-made sandwiches, and the fluffy pancake-like snack of the fjords, the svele. There's also a whole bunch of salty and sweet snacks, along with cold drinks and of course, plenty of coffee. 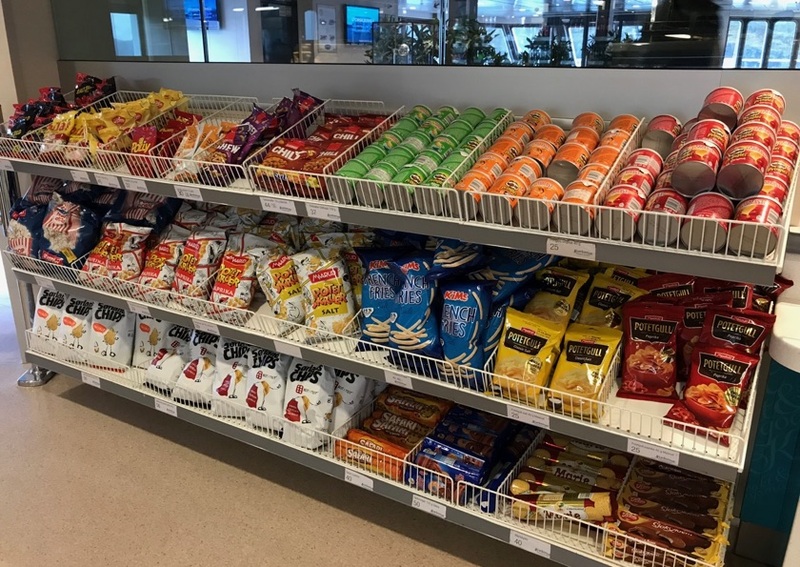 Buying snacks on board the ferry isn't cheap, but it's a convenient option for many. I saw several lorry drivers taking advantage of the enforced 40-minute break by having what looked to be their main meal of the day. 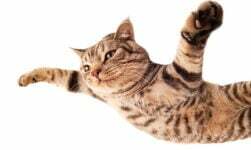 There's an announcement made over the public address system with around five minutes to go before arrival, which leaves you with just enough time to make a quick bathroom break before heading back to the car. Upon leaving the ferry you drive straight back on the E39 to continue your journey. 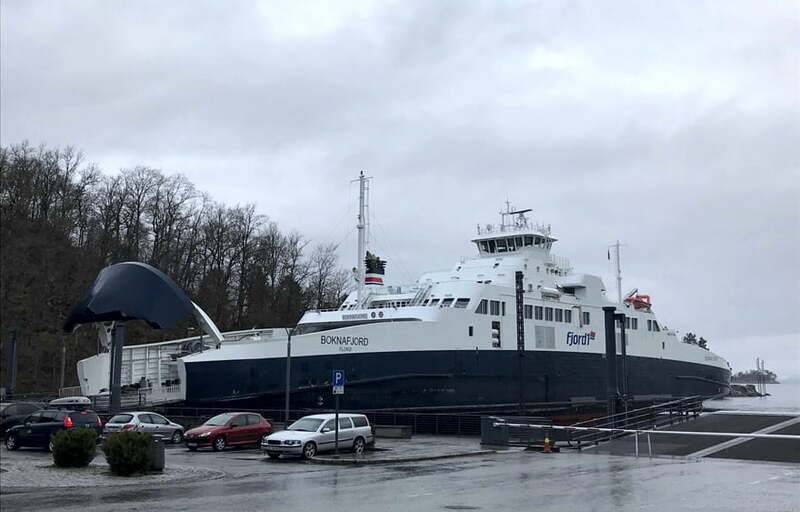 At the time of writing (April 2018), the ferry costs 231kr for a car plus driver, with an extra 72kr charge made for each additional passenger, 36kr for kids. A motorcycle costs 120kr, while vehicles over six metres in length are charged more. The ticket booths accept debit and credit cards as well as cash. It's quite pricey but car ferries cannot be avoided if you're driving around the fjords. 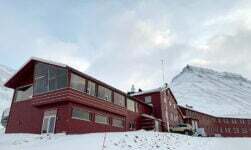 I wondered to myself what people who live on the northern side of Stord must do, but later discovered there is a monthly pass at 1,250kr, so a local would only need to make five trips to cover the cost of the pass. I strongly recommend taking a road trip around the Norwegian fjords to all visitors as it is a truly unique experience. Not only can you explore the Norwegian landscape at your own pace, you also get to experience Norway as the locals do. We were there last June (2017), staying several days in Bergen after a Hurtigruten cruise up the coast, and wanted to see the Viking History Center at Avaldsnes. I was not interested in trying to drive, so we took a public bus from the Bergen terminal to Haugusund and walked the rest of the way. It was one of the highlights of a very memorable trip, but the real high point was when we reached the ferry and the bus drove right on! Ferries we’d experienced in the US are not capable of handling large trucks and buses (and most travel them via car or foot), so we expected to get off the bus, walk onto the ferry, and board another bus at the “other end.” Like you, David, our trip was almost totally during VERY rainy weather, so the views we hoped to enjoy were negated, but the ferries were truly glorious! Clean and neat with plenty of comfortable seating, well appointed restrooms, good food and beverage choices for those desiring it, and lots of room to explore and walk after sitting for a while on the bus. Thanks for highlighting this part of exploring Norway! Thank you for the information! 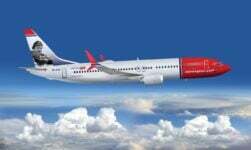 Very helpful for us visitors trying to navigate Norway on our own! If you drive an electric vehicle it’s 115kr. Rollroads are free for now but by end of 2018 they will pay half of normal cars.